Objective: Stress, anxiety, and depression are common problems among health professionals. Among health units, working in intensive care units (ICUs) are particularly more stressful as they deal with critically ill patients. The present study aimed to investigate the prevalence of anxiety and depression and the risk factors in an ICU staff. Material and Methods: The ICU staff at our hospital was included in this cross-sectional study. In addition to demographic features of participants, medical histories and smoking statuses were recorded. The Fagerstrom Test for Nicotine Dependence and Hospital Anxiety and Depression Scale (HADS) were conducted. 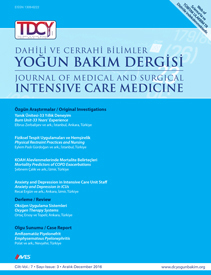 According to the HADS score, participants (score ≥8) rated as “borderline abnormal” and “abnormal” were together considered as a case group. Results: In the present study, 112 ICU staff including 84 nurses, 23 assistant personnel, and 5 doctors were included. Of the participants, 57.1% (n=64) had at least one of the symptoms of anxiety and depression and 26.8% (n=30) had both symptoms. Of the participants, 34.8% were smokers. Conclusion: Being an assistant personnel in the ICU and the presence of comorbid diseases were found to be the main risk factors in the development of anxiety/depression.